Try this: Find a young person between the ages of four and twenty-four. Show them a picture of a cow and ask, “If you cut a cow in half, do you get two cows?” Even the four-year-old will shout, “No way!” Children understand that a cow has certain parts—hearts, lungs, legs, brain, and more—that belong together and have to be arranged in a certain way for the cow to live. You cannot have the tail in the front and the nose in the back. As adults, it is easy to miss this simple truth: a cow is a complex, living system, in the same way that the human body, a family, a classroom, a community, an organization, or an ocean is. A system is composed of parts and processes that interact over time—often in closed-loop patterns of cause and effect—to serve some purpose or function. Living systems, unlike a collection or “heap of stuff ,” share similar characteristics. In systems, it matters how the parts are arranged. at is why a cow cannot have the tail in the front and the nose in the back. 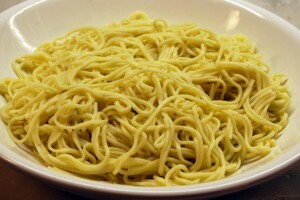 And why a stomach does not work on its own, and the body does not work without a stomach. And systems often are connected to or nested within other systems (for instance, a person may be nested within a family, school, ecosystem, community, and nation). Sounds simple, right? But here is the challenge: much of today’s education remains focused on discrete disciplines—for example, math, science, and English. Science is taught in one class. The bell rings. The student moves onto math and then, perhaps, to English—and never the twain shall meet. Such a fragmented approach reinforces the notion that knowledge is made up of many unrelated parts, leaving students well-trained to cope with obstacle-type or technical-based problems but less prepared to explore and understand complex systems issues. In medicine, for example, obstacle-type problems are those that can be clearly targeted and fixed, such as a broken arm or an acute disease, like appendicitis. A systems approach is more effective for chronic and complex diseases, such as diabetes, where the interaction of factors—lifestyle, family history, environment, etc.—also plays a role. Issues such as climate change, economic breakdowns, food insecurity, biodiversity loss, and escalating conflict are matters not only of science, but also of geography, economics, philosophy, and history. They cut across several disciplines and are best understood when these domains are addressed together. Students and adults must be able to see such important issues as systems— elements interacting and affecting one another. In the case of climate change, a systems view shows the link between politics, policy (for example, legislation related to carbon emissions and deforestation), the natural sciences (particularly forests, which help stabilize the climate by absorbing heat-trap- ping emissions from factories and vehicles), and a person’s own consumption habits. Without a systems view, the complexity can be daunting, and the result is often policy resistance or, worse yet, polarization and political paralysis. The excerpt above is from an article I recently wrote for World Watch Institute’s 2017 State of the World Report. For the complete article, click here. Thank you to Draper L. Kauffman Jr., author of Systems I: An Introduction to Systems Thinking, for your inspired cow question, posed now over 30 years ago. But wait. Why are we celebrating? Like many of us in the applied systems theory field, the Army (and in particular, General McMaster) has recognized that, “some problems in the world are not bullet-izable.” So the complexity of the Afghan situation cannot be condensed into bullet points, after all. PowerPoint, a favorite tool of the military to convey vast amounts of information, is under fire because, as General McMaster points out, it takes no account of interconnections and interrelationships among political, economic and ethnic forces. General McMaster, we the scientists, practitioners and educators in the burgeoning field of applied systems science applaud you with one hand. We agree with you that problem solving requires a focus on interconnections, rather than on parts in isolation. Indeed, if you look around you’ll see a systems approach is driving the search for solutions for many of the problems we face in the environment, engineering, and in human societies. More and more, we see food, climate, childhood obesity, poverty, energy and other global challenges “systems” issues. 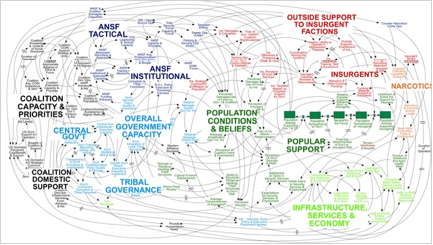 Yet when the interconnections and interrelationships of American military strategy were represented (as they were in this PowerPoint slide shown in Kabul), General McChrystal brushed it off as too complex and therefore not understandable. What’s a leader to do? Most leaders are required to drive action. They must clearly state a goal, line up a set of actions, exert pressure, and then reach the goal. Many leaders would agree that when lining up strategy, bullet points over-simplify and in the end, mislead. Yet complex systems maps are, well, too complex. Let’s pause here for a moment to ask the elephant-in-the-room question: How did we get here? How did we get so bullet point and PowerPoint obsessed? Of course, that could be the topic of a much longer blog (or book) but here is one, short answer: We Americans are encouraged to focus on objects rather than relationships. There are many other influences, such as language structure, compartmentalization of disciplines in school, and more. It’s no wonder our military leaders get antsy when they see a complex systems map. Most Americans, including our military, industry and government leaders, were not taught to think systemically; we were taught that the best way to understand a subject was to analyze it or break it up into parts. When presented with bullet points, ask questions. Probe how those elements may be interconnected in closed loops of causality. Imagine you are in the audience as a presenter concludes his or her presentation with a list of “Next Steps.” One step is to “train future leaders” in a specific research or problem-solving approach. The next step is to “increase funding for special projects”. Rather that nodding your head and swallowing the list whole, pause, and ask: “What will happen if we train more future leaders? Will that have some impact on the our ability to ‘increase funding for special projects’?” Look beyond the bullet points for multiple causes, effects and unintended or unexpected impacts. “What? !” you say? Ask more questions? There’s no reward in that! As a general, manager, or any type of leader, I need to know where to exert my effort, my resources and my attention. I can offer you this promise: If you find ways to work with your team to map either the current or desired reality of a complex issue, using pencil & paper sketches, PowerPoint or computer models, you will: a) uncover a host of unintended consequences that emerge from the interactions among your decisions, b) discover unforeseen leverage points, and c) make more informed decisions and policy changes that will likely lead to positive results. As a side benefit, you will be more likely to get off that problem solving treadmill, where our “solutions” often only create more problems or make the original problem worse and, as a result of creating causal models as a group, you will experience greater clarity and learning among group members. (By the way, if you don’t do these things, Joseph Campbell has a warning for you: “People who don’t have a concept of the whole, can do very unfortunate things…”). And what about PowerPoint? Is it such an evil tool? In my opinion, the Army missed the point about PowerPoint. PowerPoint, like any tool, it is only as good as the person using it. You can dumb down complexity by parsing out information into mind-numbing sets of bullet points. You can also use PowerPoint to represent complex interrelationships and dynamics by using arrows, icons and builds. 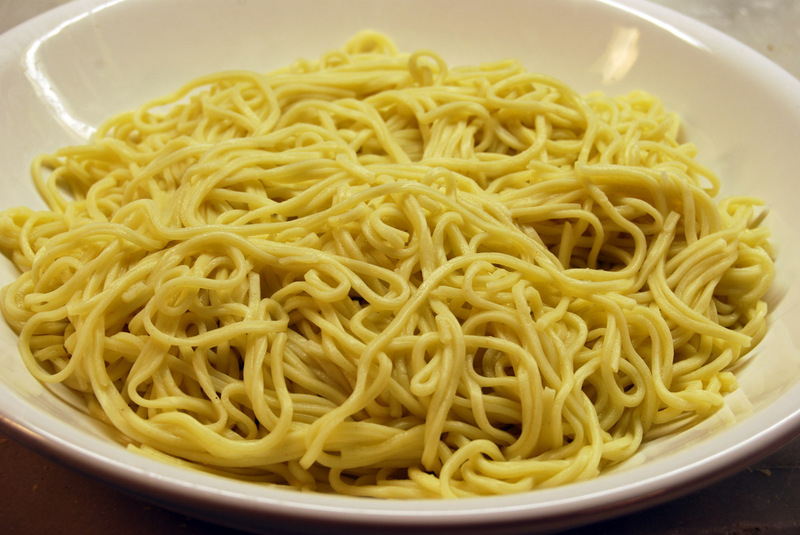 The mistake made with the American military map is that too large a serving of spaghetti was put on one plate, instead of showing one noodle (or causal link), and one domain (e.g., tribal governance) at a time. (My assumption here though, is that since the map was created by the highly-skilled PA Consulting Group, the map was presented to the generals one section at a time). Whether you’re an educator, business leader, physician, urban planner, engineer, community organizer, or military general, it’s time to be curious about how this is connected to that. We all need to move beyond laundry list or bullet point thinking to seeing and thinking about patterns of interaction, networks and other lines of inquiry and problem solving that more closely matches the more interdependent, complex world we live in. For another system dynamics perspective from on the New York Times article, see this post from Chris Soderquist. Many thanks to Gale Pryor and John Sweeney for their thoughtful commentary on early drafts of this post). *What are “closed loops of cause and effect?”: When we “get” the idea of closed loops (vs. straight lines) of cause and effect, we understand that closed “feedback loops”— circular loops of mutual causality that amplify change — underlie the spread of a rumor, the growth of a virus, or a successful person’s willingness to take on more work. Reinforcing feedback loops act as engines of growth: change in a system feeds back to cause even more change in the system. We also look for balancing or self-regulating feedback — a set of interactions that return a system (like your body, an ecosystem, market systems) back to a state of equilibrium. By their very nature, balancing feedback works to bring things to a desired state and keep them there. When we understand balancing feedback, we stop using our thermostat like a gas pedal, increasing or decreasing the temperature to suit our moment-by-moment needs. Rather we let the internal feedback structure do its work, allowing the temperature to self-adjust to a desired temperature.